Camping is always fun and perhaps the most relaxing experience one can get away from the hustle bustle of city life. However to maintain the joy of this outdoor activity, you need perfect gears, else your leisure time can turn into mess. Out of many gears, here we are talking about mattresses that you can carry with you in the wilds. A good mattress will not only let you sleep tightly, but will also keep your fatigue away. 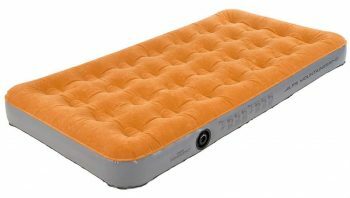 When seeking to buy your first air mattress, there are abundant brands with unique features to make your choice. Decision making can get complicated in the process of zeroing in on the right model. To guide you in the decision making process, we have put together this useful buying guide on the best camping air mattress. Essentials are included to help you get to know all the options and terminology involved for each brand. When looking to shop for an outdoor air mattress, you need to Consider the following factors. This is a critical factor when making a decision on which airbed to purchase. If you desire comfort and more luxury, you will need to part with some extra bucks. Cheaper alternatives are available for those on a shoestring budget; however, these cannot be compared to their pricey counterparts. It’s not to say that there are no cheaper airbeds which work well. What matters most is your judgment when making a choice among the many brands. All the airbed brands on the market have a particular size. It’s up to you to decide what bed size you are going for. Thinner or low profile airbeds are available lacking the added base, and they are slightly cheaper, smaller and more compact. Thicker ones tend to attract a higher price tag than the thinner beds since they promise more comfort. They also come with many more extra features. When looking for a mattress, always watch out for the key features it offers. Some offer amenities like pumps for inflation and deflation, design, cot or frame. It’s then up to you to decide on which features wow you, to choose that particular brand. Always go for a bed which is easier for you to use. You would not want to spoil your camping adventure with an airbed which gives you trouble. A good bed should not give you any problem to assemble, inflate, deflate or pack. You should always keep the weight of the bed in mind, so that it suits your camping needs. A heavier bed with a cot is not appropriate on a car camping trip. A sleeping bag would be a better choice since it’s easy to carry. Each bed has a specific weight limit is supports. You will find it disturbing to purchase a bed which cannot hold your weight. Since it will deflate more than usual and develop leaks, it will be a complete waste of money. So, always check for weight specifications when making your purchase. When planning to go camping in a group, Consider the dimensions of the bed you are buying. Beds which can support an extra occupant are preferred. Also, the ability of the bed to be combined with another comes in here too. You should be able to join two beds without creating discomfort to the occupants. Airbeds have diverse types of pumps. Some require external pumps while others have inbuilt ones. This determines the ease at which it can be used. Mattresses with external pumps are always cheaper than those with internal ones. External pumps manually powered by foot, battery or mains are powered by an external tool. And if you lose it, an extra cost has to be incurred to get a replacement. These are getting outdated, and internal ones are becoming more popular. If you want recommendations, it won’t hurt to check out these top rated air mattresses from prominent manufacturers. This is the ultimate choice for sleeping well while camping. The Therm-A-Rest NeoAir Dream Air Matress puts together comfort, a contour hugging pillow top, plus top notch NeoAir mattress technology. You get superb next to skin comfort and all around warmth with 4 inch stable loft. The 3 inch NeoAir core can be removed for use independently if you require less weight. Enjoy double wide luxury with straps that connect two mattresses using a couple of kits. It comes with a stuff sack, carry handle, Torrent Pump (which inflates the NeoAir mattress within 1 – 5 minutes), and a repair kit. 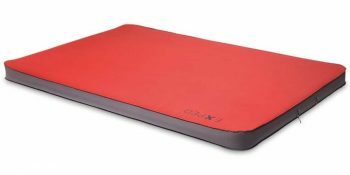 It’s a favorite for many people since its comfy even on hard ground and side sleeping, packs quickly and is warm to sleep on. On the downside, the microfiber cover picks up dirt, uses 4 CR123A batteries for the pump, which are not included and quite expensive, and the Torrent Pump needs some modifications. Modular Protective cover can be removed and washable. Plus the mattress can be used separately. With inner mattress: 3 inches, thick with an R value of 2.6. Integrated straps combine with another NeoAir Dream Mattress for double wide luxury. Modular protective cover of this mattress can be removed and is washable. With inner mattress of 3 inches, thick with an R value of 2.6, the mattress can be used separately. Integrated straps combine with another NeoAir Dream Mattress for double wide luxury. Altogether, this is a great choice for people who love spending time outdoor. Related: Perfect for travelers, campers, and every adrenaline junkie, Therm-a-Rest Compressible Pillow is one of the most often bought products with this bed. The foam expands big in size and is comfortable for you for a good sleep. Affordable and comfortable this is a pillow that you can carry with you anywhere anytime. Enjoy an exceptional night when camping on the Lightspeed Outdoors 2 Person Air Bed. It comes with a patented stabilizing system that evenly distributes weight using 192 independent connectors between the top and bottom layers. The mattress is PVC and phthalate free since its manufactured using high grade polyester Oxford. This is laminated with thermoplastic polyurethane (TPU). The combination of these superior materials makes this bed unique from regular beds. It’s less prone to stretching and ballooning. TPU is characterized with high durability standards, resistance to puncture, and abrasion. With this, you can rely on your Lightspeed mattress to be leak free throughout the years you use it. There are no bouncing or movement disturbances between partners on this mattress. With a battery operated pump and built in Boston valve, you can adjust how firm you want the mattress to be. There’s an inbuilt handle for easy positioning and a bag for packing. It comes with a Boston valve which makes inflation or deflation easy and also allows adjusting for comfort. You don’t always have to be scared of your cat or dog coming near you on this bed; no other product beats it for durability. With 6 pounds, this is a very light and durable bed convenient for travel and storage. It’s less than half the weight of most air beds. Two adults can occupy this bed comfortably. Related: Image Portable LED Camping Lantern is one of the products that you can buy with this sleeping pad. Versatile light and ultra bright, this lantern has both high and low setting. Constructed with military grade, this lantern is extremely lightweight and can be carried on long tours without any bothering. When not in use, you can easily collapse it to fit it in your bag. If you mind taking the comfort of an indoor bed with you, then the Coleman Airbed Cot is the ideal choice. You just need to connect the included 4D pump to the Double Lock valve for easy, leak free inflation. After finding the perfect firmness, its airtight system will help keep it in one position. This product is factory tested to be leak free. The ComfortStrong coil system will provide all night support even for those with back problems. It holds up to wear and tear well. It not only offers a place to sleep, but also has a sewn in cover that keeps the airbed in place on the sturdy steel frame. The bed comes with a sleeve that holds the mattress in place. When you’re ready to pack up, the Double Lock valve enables you to deflate the bed very quickly. It folds up into a carry bag that you can transport and store it easily. However, it stacks up thick. The mattress comes with two side tables with cup holders for keeping drinks and other personal items. To increase the sleeping space and support, the bed is attached with cot and airbed. All over it supports 600 pounds, but can lose the air over time, so you need to refill it again and again. Related: People who buy this product also buy the AmazonBasic Tent. The product is imported and is made up of 100% polyester. This family size camping tent can accommodates up to 8 campers. Rainfly has been added to the camp for protection against rain. Shock corded poles and easy to flow instructions make it easier for you to put-up the tent. Being light weighted and affordable, this family tent is the perfect purchase for you. You need a reliable, quick, and portable bed to enjoy a good night’s sleep; then you will surely invest in a Stansport Self Inflating Air Mattress. This bed is designed to provide a comfortable night’s sleep. It has a lot of unique features. It’s Self inflating; this ability is the most important feature of this air mattress. It is made from wholly bonded material for reliable outdoor performance, and offers weight support of as much as 300 pounds. Its main point is the fact that it inflates on its own and can easily be folded into a small shape to be carried wherever your camping adventure takes you. You can apply it as an added layer of insulation on your tent floor or as a sleeping mattress in its own right, and with its Considerable length, it supports users as tall as 6 foot 4 inches. Its nonslip surface ensures that it stays put. On the small side, the included stuff sack is mesh which tends to get shredded as soon as it touches granite or sandstone. Also, it’s somewhat dull and not for side sleepers. This airbed remains a God sent solution for all your camping needs. This airbed is big enough to accommodate a surprise guest overnight. Related: Stansport Outdoor Camp Pillow is one of the mostly purchased products with this sleeping pad. Soft flannel plaid outer shell lets your head rest comfortably. The pillow is machine washable and can be stuffed into your bag easily. Lightweight and affordable, this pillow is the perfect choice when you are camping or hunting in the wild. The Exped Mega Mat 10 Air Bed is modeled using 3 D Construction to come up with vertical sidewalls for wall to wall comfort. It’s fitted with air cored foam insulation to provide self inflating convenience. The Exped Mini Pump included is used for lung free topping up. Also, the velvety soft tricot top surface is suitable for next to skin comfort. It’s the flagship of comfort for its manufacturing company. The mattress is exceptionally warm, soft and plush; it’s also lighter and smaller when packing compared to other brands. This airbed is durable and protected from damage since it’s flat in design and non protruding. It will leave you yearning for more space. Designed with 3 D Construction with vertical sidewalls for wall to wall comfort, this mattress also includes a lung free topping up. Individual modification of the bed’s firmness can be achieved by tapping on the one way flap of the inflation valve, it will release a little amount of air but you don’t have to worry much. The mattress also gives velvety soft tricot top surface for next to skin comfort, which is its biggest perk at this price. Related: Therm-a-Rest Compressible Pillow is one of the most often bought products with this sleeping pad. Perfect for campers and travelers, this foam expands fully to be comfortably used as a pillow. The brushed polyester pillow can be pulled back into a small pack, making it easier for you push it back in your camping bag. Campers and travelers both can use it perfectly and it’s also an affordable choice with all the perks it gives. Having plush flocking on the top, the Intex Classic Downy Airbed Set with 2 Pillows has a more luxurious sleeping surface. It helps keep bedding from slipping. This package comes with two inflatable pillows including a hand pump. Modeled with durable heavy gauge vinyl, the cozy flocked top is easy to clean and waterproof for camping use. It’s equipped with a quality tested, 20.8 gauge waterproof flocked top. Plus 14 gauge vinyl beams with 15 gauge sides and bottom. The 2 in 1 valve comes with an extra wide opening for quick inflation or deflation. The bed is up 8.75 inches from the floor, and with 60 by 8.75 by 80 inches (WxHxL) is ideally an official Queen sized bed. It ensures a tight fit for fitted sheets. Inflating this takes only ten to fifteen minutes, comfy and compact. The bed can support a weight of 600 pound. It folds compactly for easy storage. You can easily clean it with mild soap and water. This airbed promises a good, low cost, portable solution. This mattress has been known to develop leaks and random deflation problems. It’s worth a try for someone who requires a quick sleeping solution on the move or needs to entertain a surprise guest who has to stay overnight. Provided it is available at such a low price, the Intex Classic Downy Airbed Set is worth trying. 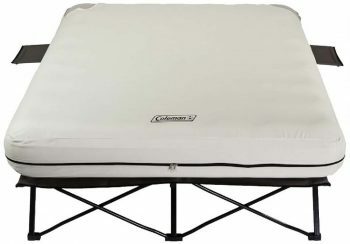 Related: Coleman Tent Kit is one of the most bought products with Intex Air Bed. There are four 10 in steel tent pegs with flat striking head to secure your tent. The stakes in the ground are secured with rubber mallet and the steel rod puller makes it easy to pull the stakes. You will receive the packet with nestling hand broom as well as dustpan. At such an affordable price, thus tent kit is quite an asset. 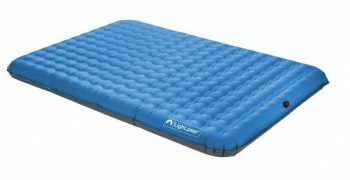 Whether you’re heading out for a weekend camping or staying with out of town friends, you can always count on an Alps Mountaineering Rechargeable Air Bed. These comfy beds tend to fit in almost every tent. You’ll be assured of a great night’s sleep just as well as you do in your bed at home. ALPS air beds come with special, top of the line fabric and coil Construction which guarantees the best durability and comfort. They are the perfect brand for indoor or outdoor use. The bed is reinforced with Construction to provide a comfortable and uniform sleeping surface. The outer ring provides a stable edge support. These beds are manufactured using industry leading, extra thick and durable PVC materials. No brand beats them in being puncture resistant. They also come along with welded seams which offer additional durability. Their bottom and side fabric are 17% thicker than the leading competition, and the top is 10% thick. With a plush, velvety soft flocked top, you will enjoy a luxurious sleep surface. And your bedding will never slip or slide around. For an extended pump, life ensures to charge it 12 hours before use, and charge it for 12 hours for repeated use. And make sure that the battery is fully discharged before recharging. 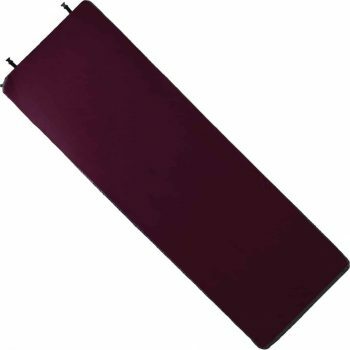 Related: There is an ALPS Mountaineering Lynx 4 person tent that you can buy with this mat. The tent provides easy assembly and ventilation and can be put down within few minutes. Provided that it has two door entries, you can enter and exit without troubling your internal setting. Two vestibules are given in the camp to increase the storage space, all over; this one is a perfect purchase that won’t even cost you much. So that concludes our list on some of the best outdoor air mattresses available. A final tip: on first use, fill up to 90 percent and deflate after 3 hours repeatedly to make the plastic get used to expansion. Don’t overload and always check for leaks, we will also recommend you to keep it away from prickly objects and pets. What kind of air mattress do you use when you go camping? What are the features that you look for to choose a good one? Let us know in the comments!